Tutorial Thursday today! Yessss! 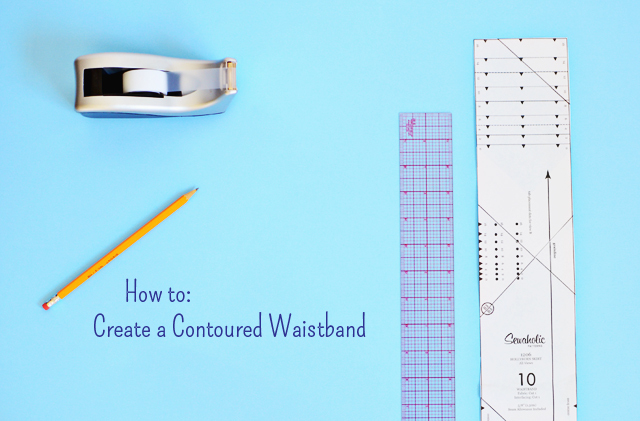 Today, I thought I would share a quick tip for creating a contoured waistband. I've done this many times on many patterns. I thought I would show how to do this on the Hollyburn skirt waistband piece as it's a perfect candidate for this type of thing. Just so everyone is up to date, Hollyburn is a skirt pattern put out by Sewaholic. Before we get to the tutorial, I thought I would share why you might want to do something like this. I find that on my particular figure and with a waistband piece that is anything more than 1 inch wide, I have to do this. Maybe I have a bit too fluffy of a tummy - Dr. Pepper is my vice after all. And chocolate and all that. I find that a little contouring at the waist helps it to sit better on my figure and quite frankly, it's a little nip and tuck that looks good for me. Now, take it away Contoured Waistband tutorial! On the Hollyburn waistband piece, you'll find that it's a rectangular piece that is folded in half to create a waistband on the skirt section. To contour this waistband we'll have to change this up a fair bit. We're going to create two separate waistband pieces - a waistband and a waistband facing and both pieces will be cut on the fold at center front. Follow me? First, find the fold line on the waistband, mark it and then add on 5/8" seam allowance to one side. I've marked my fold line in pink and the seam allowance in green. Cut away the excess. The Hollyburn waistband is one entire piece so you'll need to find the center front of it and cut that away too. That center front will now be cut on the fold, no need to add seam allowance. 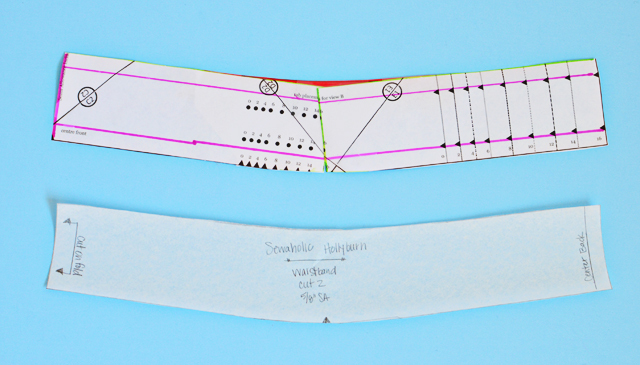 Mark the seam line (in pink again) on the other side of the pattern and cut into the pattern at around the side seam area, to but not through the seamline. Cut on the other side of the seamline, to but not through the seamline which will create a paper hinge. Oh, paper hinges. The story of my life. From there you can nip in the waist however much you need by overlapping and taping the longer cut section together. The pictures do a much better job of explaining this, I think. Right about now, you're probably wondering how you'll know how much to nip in. When I do this adjustment, I measure how wide the waistband section is (this is the vertical measurement of the waistband). Then I take two pieces of elastic and tie them around my waist. The first I tie at my waist - or where I want the top of the skirt to hit - and then I tie the other piece around the section of my waist that is down the vertical width of the waistband. In the case of the Hollyburn, the waistband is 2 inches wide. So I would tie that second elastic 2 inches below the first. Make sense? Now take the measurements around both areas and compare. I'm usually about 1 inch off or so. 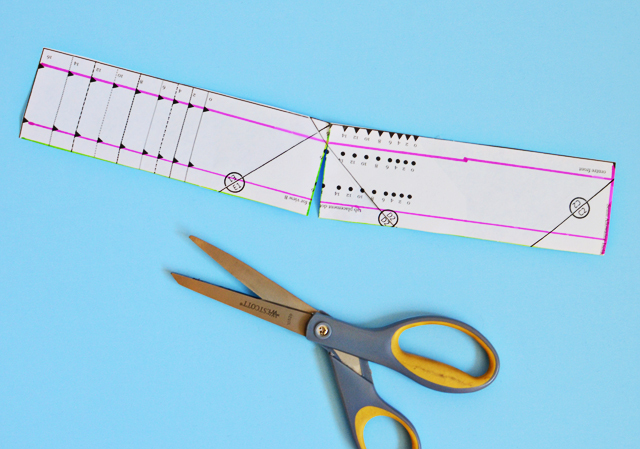 You'll divide that number by 2 since you're working with half of the waistband piece (because we just chopped off at the center front and now we're cutting the waistband on the fold). So I need to overlap 1/2 inch. WHEWWWW! Once you've figured all that out, then it's time to smooth out those angles. Not only are those lines hard to sew, but it wouldn't look all that great if we sewed this piece up as is at the moment. 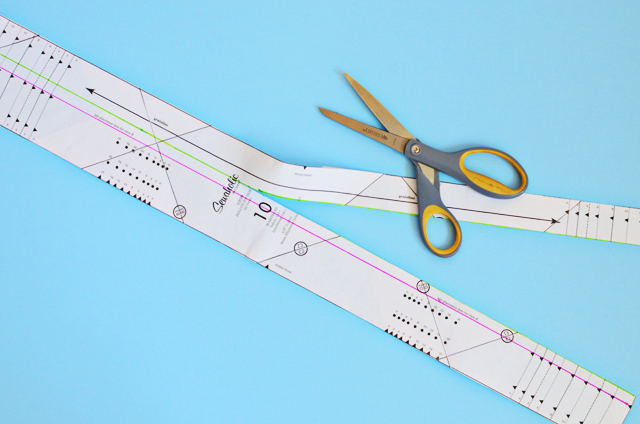 To smooth out the lines, you'll need to use a curved ruler. 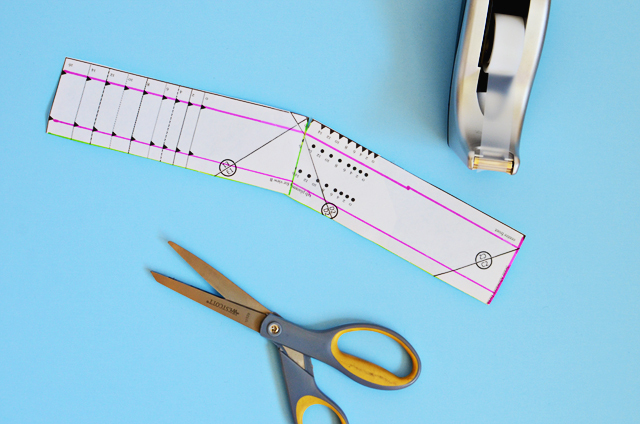 Shimmy up your curved ruler along the angles and find a curve that connects and fills in (or takes away) in a nice looking curve. You'll be adding to the valley and subtracting from the peak. I've added to the valley in red and then I subtracted approximately the same amount from the peak and cut that off. To make this whole thing a bit easier to see, I opted to retrace the waistband for you. See how you have a nice smooth curved waistband now? 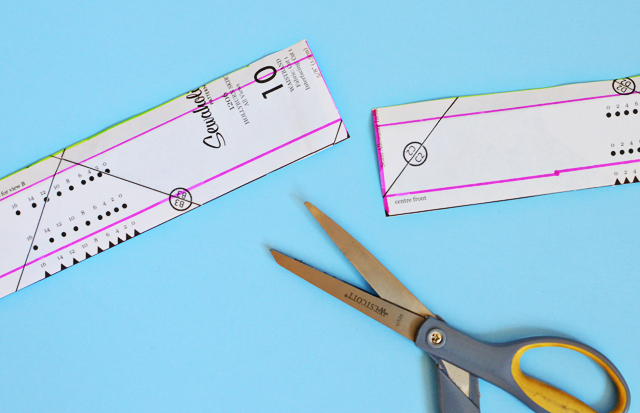 You'll cut the center front on the fold, cut two pieces and voila! Contoured waistband! If you have a major contouring that is needed in the waistband (like more than 1 inch in the round), I would say that it would be best to do the above in two places instead of one. So think of the waistband in thirds and nip and tuck at 1/3 and then 2/3 mark. Make sense? Sometimes when the waistband gets wider - like 5 inches, which would be more of a yoke - then it's better to do this in more places than just at the side seam. Makes for a softer curve. And that's it for today's tutorial. Enjoy friends! I'm right there with you - a little fluff in the tummy (too much Coke... and fries...and food over all....but it tastes so good!) I tried a contoured waistband once and it really did help the garment to fit better, but I'm certainly not a pro at them either. I've replaced a straight waistband with a curved one before; it really does improve the fit a great deal! I just cheated, though, and used a waistband from a different pattern which I already had; good to know how to do it properly! Well done, you always manage to come up with bright tips even for people like myself who have been sewing for over 60 years! Hope your classes go well too. What a great tutorial, I find the same on the Hollyburn and on the Gabriola and I fudged a curved waistband but this would be such an improvement on that! Wow, do you believe that JUST LAST WEEKEND I was making one of these. Being a sewing bear of little brain, I cut a nice bias piece. It worked out pretty well, all things considered, but this would've been much better! Thanks for doing this!! I have a Hollyburn in my future and after reading that you made the modification I was hoping hoping that you'd do a tutorial. I love your tutorials. Great tutorial. It's so nice to have an updated reminder of these basic skills that I learned years ago. Thanks!! I just bought this Pattern the other day because of your version. This is a great tutorial! I'll be doing this to My version! Great tutorial. I will definitely be using this to deal with the dreaded gaposis that I'm so often faced with. Great and simple tutorial, thanks so much! Thanks for the tutorial. I love the way the Hollyburn looks on me, but this may just make it sit even better. Your timing is impeccable! I am making my first Hollyburn this weekend and this will make it even better. I find that doing this makes me "feel" like my waistline is smaller. So VAIN! It's comparable to cinching it all in with a belt, if you catch my meaning. Also, it allows my skirt to hit a little below my natural waistline - which can feel right up in my ribcage sometimes. Adding a little contour at the waist, justs adds a little polishing to the final garment - in my opinion only. Having the straight waistband is just fine too and that works really well for some. This is just a tip for those it doesn't work for as well. I would say, test this out! You might find you really like it or you might find it makes no difference whatsoever. Oh good! I'm so glad I'm not the only foodie, junk eater out there! Yay! This is a great way to do it too! I'm all about cheating. It's the only way to sew. Awww! Thank you! Classes are going wonderfully! It feels great to be teaching again and I am loving getting know new people and seeing all my old sewing friends again. It's quite the life, I tell ya! So glad I could help! 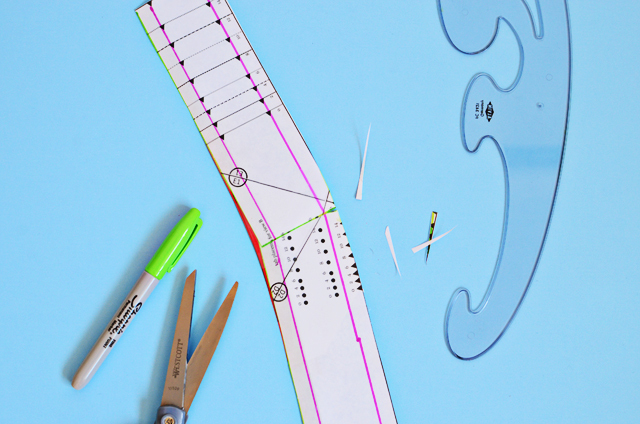 I'm all about trial and error - it seems one of the best ways to learn sewing, fitting and pattern drafting. I feel the same. It's a small thing, but it's awesome. I read on a bumper sticker the other day that said, "It's a thing, you wouldn't understand." Totally feel that way a little about this - but its really fun because all of you do understand. Ha ha! Oh this is a GREAT idea! Thanks for your input too - Bias waistbands can seriously be the bomb! Thank you - that made my day! So happy you love my tutorials! Thank you! so very helpful, i really don't like the rectangle type bands. Question: how do hem these types of skirts? i kind of feel that the horsebraid makes them a little too costume-y...many thanks! Thank you for this Sunni. I made the Holyburn for the first time last year, and while I loved the skirt I have always felt there is something not quite right about the waist - I believe this may be the fix that I need!!! Will definitely be trying this out (after baby arrives)! thanks so much for putting this together, I will definitely be trying this out. Just curious, do you choose a waistband size a little larger than your actual waist? Because you are overlapping the pieces rather than spreading them, wouldn't that make the top of the waistband too small? Oh wow, Sunni, I can't believe you posted this - as you know I've bought your fabulous wool crepe, and am planning to make at least one hollyburn out of it - and when I saw your recent post, I really wished you'd post how to do a contour waistband, but didn't want to ask - you are so busy! So thank you very very much! I can't wear straight cut bands anything wider than an inch either. this is brilliant! Thanks so much for this. I don't know why I thought it would be much more complicated.